These are the best gluten-free garbanzo bean flour pancakes. 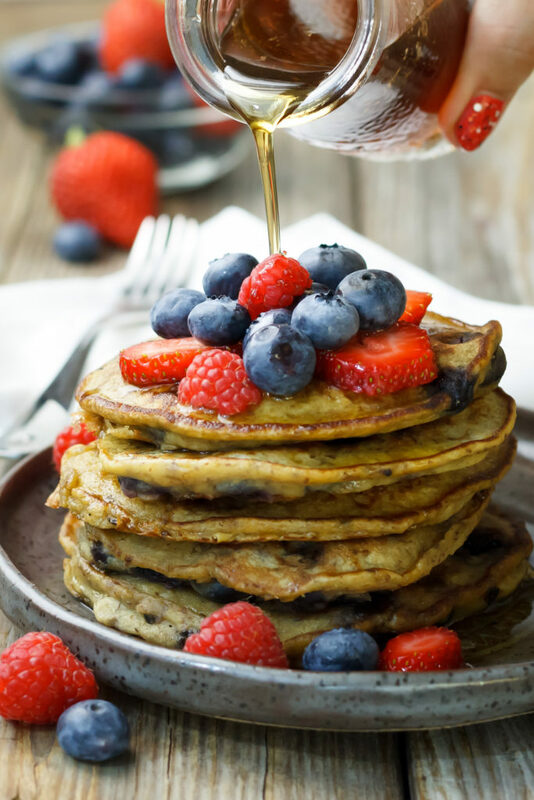 I’ve made these gluten-free garbanzo bean flour pancakes tons of times. They are high in protein and complex carbs and keep me full and satisfied for hours! I eat them for breakfast quite often because they are a really easy gluten-free solution to breakfast. Why do I eat them a LOT? I get so sick of eggs and the “regular” breakfast food. I don’t do normal pancakes because, besides the white flour issue, they basically have no protein and are high in carbs and that’s a bad combination for me. I also hate the texture of “normal” pancakes. I know I’m supposed to like the light and fluffy texture, but I feel like I’m eating glue, especially when they aren’t cooked quite all the way – or when they are all soggy from way too much sugar – gross! in the world is good! I often leave out the baking powder and the honey because I don’t think it’s necessary. When my raspberries in my garden are on, I put extra berries in and less water. If you want, you can leave out the berries, but then you will be able to taste a bit of the garbanzo bean flavor. I’ve also tried this recipe with a flax egg substitute and it turned out fine, so if you don’t have eggs or eat Vegan, give that a try. I sometimes make like 1/3 of this recipe just for me in a cereal bowl with 1/3 a banana and use the rest of the banana to make a smoothie. Since I hate undercooked pancakes, I usually overcook these pancakes so they aren’t doughy at all. Plus, I feel like that helps them taste less like garbanzo beans. Another quite different variation on this recipe is to mix somewhere between equal parts flour and water and twice as much flour than water (experiment and find your favorite thickness) and add some salt, then stir it and let it set for about 5 minutes while you heat up a frying pan on low with some coconut oil. Then pour the runny batter in the pan and let it cook for up to 20 minutes total, turning over when it’s golden brown. It makes a crispy “flatbread-like” pancake like I really like. It really brings out the “golden” taste of the garbanzo flour too. If you’re worried about the garbanzo bean flavor, don’t be. I despise actual garbanzo beans, but I love chickpea/garbanzo bean flour. It has kind of a “golden” taste. It’s hard to describe, but it’s so good with real maple syrup. But I’m warning you – once you try real maple syrup, you’ll never be able to go back to the fake stuff! I would love to know if you try this recipe and what you think of it. I think you may be surprised at how good they taste! 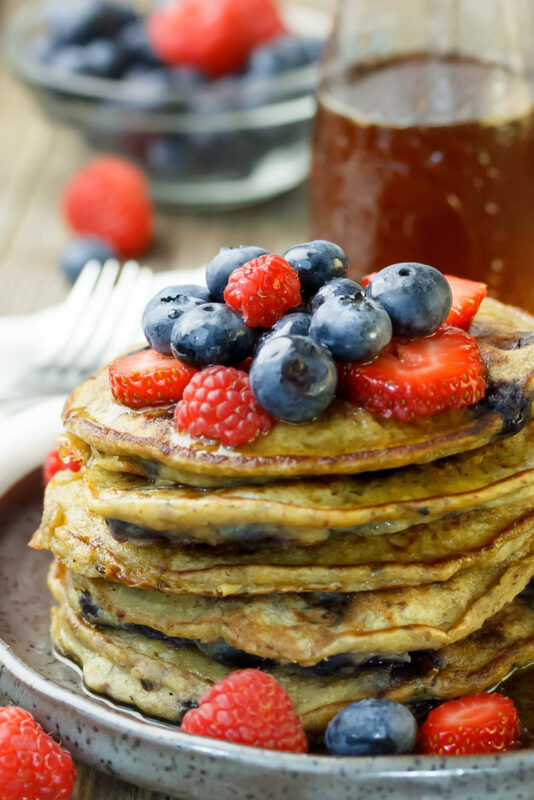 This gluten-free pancakes recipe pulls together in minutes and is loaded with protein from the garbanzo bean flour and egg. Cook 2-3 minutes until bubbles appear on the top and its golden brown on the bottom. Was wondering if you have frozen any of these and saved for a later date…my experience with chickpea flour is that the item is great made fresh and then next day not so good. Any thoughts? I haven’t tried freezing them but I do sometimes save them for the next day. They are definitely not as good but I think they are the best reheated in the toaster – kind of like a Pop Tart so maybe you could try that? Wow. This sounds great! I have a child who is severely allergic to milk, so this is good, even for him! Yum! Just made these and they were delish! I used coconut sugar and ground flax. Thanks for the great recipe! Thank you for sharing. Excellent recipe. Tried it this morning for breakfast. I fall in love with these pancakes. I did not have berries but I used raisins and cranberries. Added some apple puree which I collected from my juicer when I made fresh juice. So good to hear! I love them too. I love to make a double batch and then just warm them up in the toaster the next day. This sounds interesting! Is the consistency smooth? Somehow it seems like it wouldn’t be. Yep. Nice and smooth, at least with Bob’s Red Mill flour cause it’s been ground up really well. Yummy! I am trying these for tomorrow’s breakfast! love garbanzo beans . . . .would never have thought to do this!! We tried these for dinner and they were a success! My kids enjoyed them and couldn’t even tell the they were different. I have some garbanzo flour and was wondering what I can make with it. 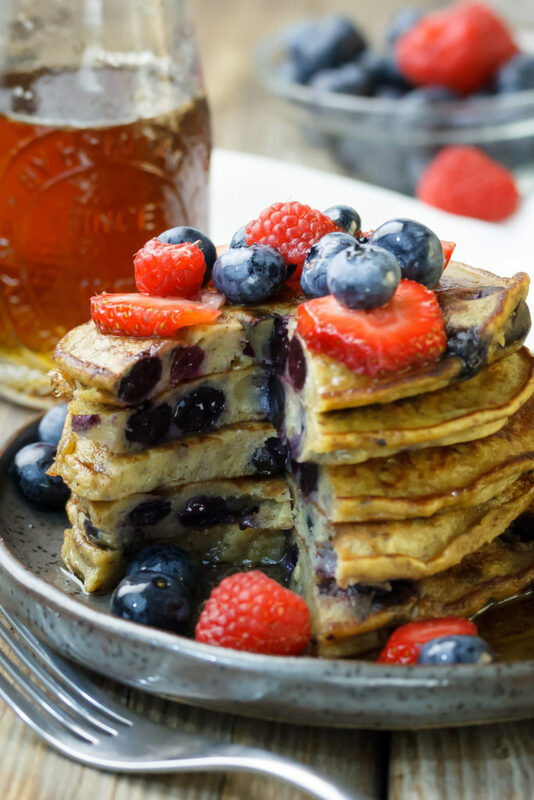 The pancakes look delicious – I’m going to give them a try! Thanks for the recipe! I made the batter and as any good chef does I tasted the batter Don’t It does not in any way represent the finished product ! The pancakes are Awesome ! I even gave my hubby a bite of the first one and he was eager for more ! We are not gluten free but I do like the added nutrition of the chickpeas over traditional flour…and was surprised it turned out so well!..and I have two very discerning diners – my husband and 5 year old daughter! I’m glad you like them. I love how filling they are and how “golden” they taste. They are so extra good with syrup. They are made for each other! This a variation of a recipe I use already. Thanks. Kevin at a Garden has a similar recipe, fewer ingredients but very good. I make a dozen at a time. Do you eat the dozen all at once, refrigerate or freeze the extras? You just reminded me that sometimes I make them light on the berries and then reheat them in my toaster, sort of the idea of an Egg-O. I should start doing that again . . . Wondering if these would work in a waffle maker? I’ve had a rough time finding allergy friendly recipes that don’t stick to my waffle maker. Hum. I really don’t know. I would think the recipe would need to be changed a bit so they don’t stick, probably quite a bit thicker. Maybe I should experiment with it. . . Thanks for the comment and the substitutions. I’m sure that will be useful to others. I made them again and used cooked puréed spaghetti squash for the banana I can’t have. Even better than the pumpkin. Thank you for a great recipe. Hello! I’m writing from Argentina! My sister has been diagnosed with gluten allergy, so I’m investigating recipes to help her out. My doubt is: can I replace the flax seeds for chia seeds? I know they also act as replacement for eggs when you activate them with water. Could they also work here? THANKS IN ADVANCE! I hadn’t heard of a chia egg myself, but googled it and apparently it’s a thing and sounds like it totally should work just fine. I made the recipe with bean flour that I had in the cupboard from years back when I was on a high protein diet. And it turned out nice despite the higher protein content. I will have to try it with the chickpea flour as I move away from wheat based products. Thanks for the nutrition information. My rough calculations indicate that the recipe makes about 8 servings. Is that correct? That sounds right. You’re brave. If I leave my garbanzo bean flour too long, it smells so strong, I get scared to try it! Hm … It smelled fine. But later that night, I had a lot of gas. Perhaps it was the old bean flour. These are so good! I made them Vegan with flax meal and their the best pancakes I’ve ever had in my life. Their filling too. The protein and fiber is a bonus. I didn’t have berries, so I used raisins like someone else mentioned. I didn’t have baking powder, so I used a little baking soda and I didn’t have bananas but they came out incredibly delicious. Thank you for sharing your recipe. I’m so glad you liked them. People think I’m crazy sometimes when I tell them how much I like them, but they really are good. I’m glad you give them a try and I love your suggestions of modifications. THESE ARE DELICIOUS!! We just got our garbanzo bean flour yesterday and I made these pancakes this morning. Thank you! I’m so glad you tried these and I’m glad I did years ago. They really are good and are so filling. But since I hated garbanzo beans as a child it took some desperation to try the flour. It’s so different though, huh? Thanks for commenting. Hopefully your comment will give others the courage to try them too!